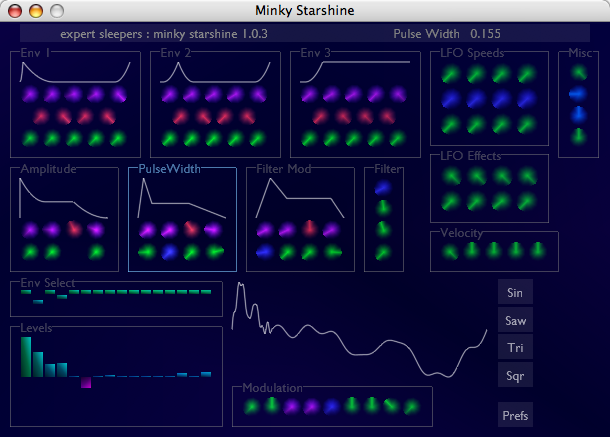 Minky Starshine is at heart an additive synthesiser, augmented with possibilities for subtractive synthesis (i.e. filtering) and pulse width modulation. A waveform is created by summing 16 independently controllable 'partials'. By setting the relative levels of the partials appropriately you can create familiar waveforms such as sawtooth and squarewave, but you can also create an infinite range of timbres in between. As well as simply setting the levels of the partials, you can flexibly assign them to three 'groups'. Each group has a very flexible envelope generator and an LFO, so you can change the balance of the partials (and therefore the timbre of the sound) over time. The LFOs have a wide frequency range and can also be used as ring modulators. The waveform as a whole can have its pulsewidth controlled. An envelope and LFO is provided, as well as control by note velocity. A resonant filter is available, capable of lowpass, bandpass and highpass and a continuous range in between. Again, control by envelope, LFO and note velocity are possible. A flexible modulation section is provided, capable of chorus, flange and delay effects. The factory presets showcase some of the range of sounds that can be produced. If you'd like to read more about the plug-in before downloading it, the user manual is online here. Initially the plug-in runs in demo mode, in which it is fully functional, except that it will time-out after 15 minutes of use. Simply reloading the plug-in resets the time-out. To remove the time-out, you can purchase a registration. The price is $29 (US dollars, plus VAT if applicable). A registration allows you to install the plug-in on up to three computers at once. 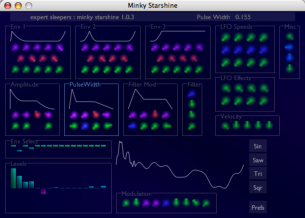 Read Minky Starshine news articles on the Expert Sleepers blog.